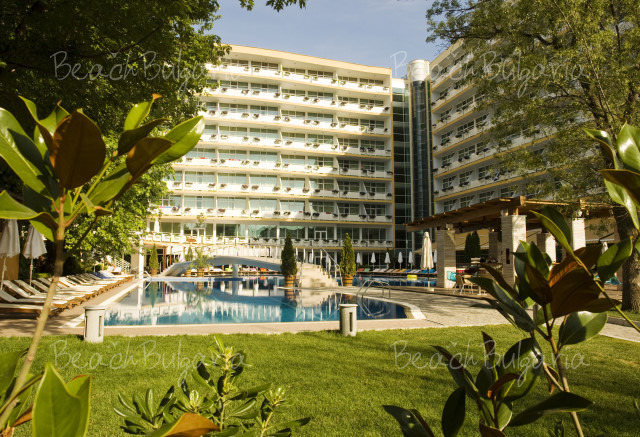 Blue Pearl hotel offers 85 luxurious suites with a splendid view to the bay and the old town of Nessebar. The guestrooms are equipped with TV, fridge, telephone, air conditioning, bathroom with a shower cubicle or bath-tub and hair dryer. Double rooms (30 sq.m) - A large premise with a king-size bed or 2 single beds and an extendable sofa suitable for 1 adult or 1 child. 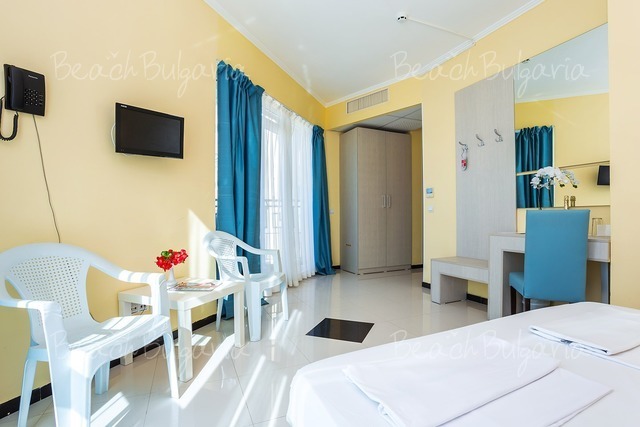 One-bedroom apartment (45 sq.m) - Consists of a bedroom with king-size bed and a living room with extendable sofa suitable for 2 adults or 2 children. Two-bedroom apartment (60 sq.m) - Consists of 2 bedrooms with king-size bed and a living room with extendable sofa suitable for 4 adults or 2 children. The main restaurant serves buffet breakfast, lunch and dinner. The restaurant features 100 seats inside and 100 seats outside. 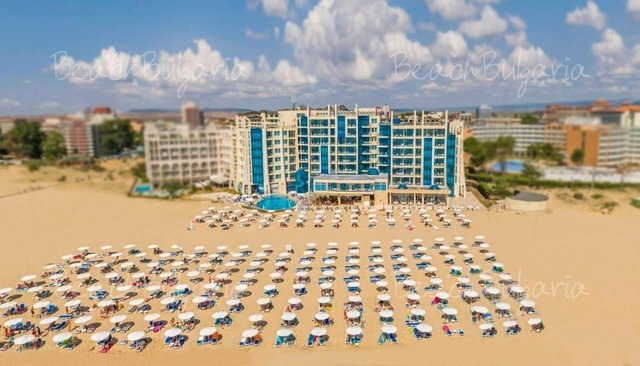 The restaurant and bars work on Ultra All inclusive basis offering snacks, Bulgaria and foreign alcoholic and non-alcoholic beverages, coffee, tea, cocktails, draft beer, wine, etc. Blue Pearl hotel offers 2 outdoor swimming pools with a children section and a fitness studio. The property features free Wi-Fi internet access in the public areas, reception desk, 16 shops, underground parking lot, hairdresser's saloon, 24-hour security, free cable internet in the hotel rooms, SPA treatments and massages, Mini club. * The prices are in Euro per room per night, all inclusive, free use od swimming pool, sunbed and parasole near the pool and on the beach. * Cancellations can be made free of charge providing details of this are received at least 35 days prior to check-in time on the day of arrival - cancellations made after this period will incur a fee equivalent to the cost of 100 % of the reservation. ** Dress code in the restaurant! Please, post a comment on Blue Pearl Aparthotel.